I have to tip my hat to the clever and ingenious people that came up with KYZ pulse metering methodology. It’s simple, easy to use, and non-proprietary. And best of all, it doesn’t require the IT department. You can bet that the people who came up with KYZ Pulses weren’t concerned about the IT department because IT didn’t yet exist! Pulses have been around for over 50 years, and are still widely used today. The history of KYZ pulses can be traced back to the electro-mechanical induction meter with an eddy current disk - the large, thin, horizontally-oriented disk that turns as electricity is used. The eddy turns on a vertical axis and each rotation of the disk represents a fixed amount of energy called the Watthour Constant, or Kh, usually 1.8 watt-hours on instrument-rated meters. This means for every revolution of the meter’s disk, 1.8 watt-hours (times the transformer ratio or multiplier) has been consumed by the customer. Early meter manufacturers designed various devices that divided the disk rotation into 2,4,6 or 12 equal parts for better resolution. These devices were very simple – a single-pole, double-throw switch (shown right) with cams attached to the vertical axis of the meter that caused it to toggle to the opposite position upon the selected rotation of the disk. As the disk turned one subdivision of the rotation (90 degrees for example, for 4 pulses per revolution) it toggled the switch to the opposite position, creating a “Pulse”. This is how the change-of-state of the pulse initiator became known as a Pulse. Of course, meters manufactured in 2012 are completely electronic or “solid state”. No longer are there any moving parts such as the eddy current disk inside the meter. Not a problem for the pulse because most modern meters emulate the old KYZ pulse standard. The Pulse Value is now programmed into the meter, although the exact method of programming pulse values varies from manufacturer to manufacturer. 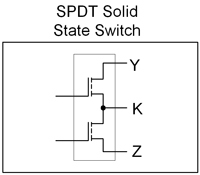 The KYZ hardware standard is electrically the same, but uses a solid-state switch (shown right) instead of a mechanical switch. By using programmable pulses, there is more flexibility since the ability to select pulse type as well as pulse value is now available. You can think of KYZ pulses as a non-proprietary and universal method of transferring instantaneous energy use information between systems. It is truly a simple yet elegant system that will stand the test of time due largely to its simplicity.